The origins of the island are mostly unknown, largely uninhabited save for the local fauna, Opej’Nor was an unnamed, untouched island of staggering size, adrift in the Doldrums for unnumbered years. Save for the odd shipwrecked survivor or victim of the Doldrums, Opej’Nor was left to fable for ages. After the fall of the Lich King, the sizeable navy of the Horde was able to return to the duties of patrol and expansion required for the rapidly expanding needs of Orc, Undead, and more. One of these navy ships, captained by Opej Ogrecrush, an orcish veteran of minor acclaim, stumbled upon the island near Southern Kalimdor. He and his crew arrived before a storm, managing to document the vast, unclaimed territory, endless forests, and the high rising peaks. The storm cut the visit short and he and his crew returned home and to report the resource rich territory to the Horde, naming the island in honor of the captain- Opej’Nor. However, when they returned with enough men to stake a claim, Opej’Nor could not be found high, low, or anywhere else. Opej Ogrecrush was dishonored and removed from command. After the Shattering and the chaos that followed, the mass of Opej’Nor was shifted and settled further in the Doldrums, coming to rest near Silver-Eye Island. It’s long travel stymied after the deep jungles of the island’s center were lanced by debris ripped from Deepholm amid Deathwing’s destructive emergence from the elemental plane. Crystals and elementals litter the tropic forests and sandy beaches, making for eerie wounds across the verdant flora. 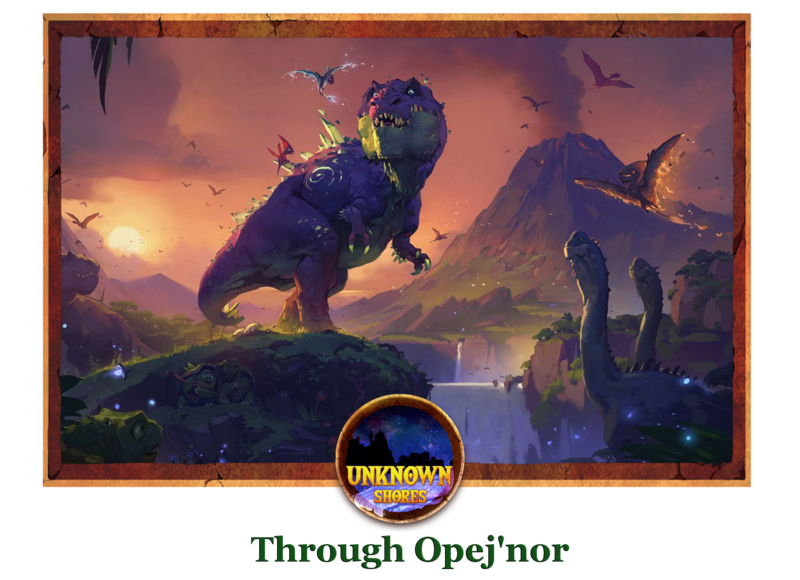 With Opej’Nor now grounded, it has become the popular spot for the sound abundance of shipwrecked survivors and victims of the Doldrums grasp since the cataclysm, many seeking to make a new life on the untouched shores and jungles. It’s hospitality is, however, often overestimated. Opej Ogrecrush - Once an efficient and loyal soldier, Opej Ogrecrush’s military career for the Horde ended after he failed to relocate the island of his namesake, Opej’Nor. Once discharged, he made it his personal mission to find the island, no matter what, and some say he’s found it- wandering the woods, restless and ruthlessly protective of ‘his’ Island. Dragor Bloodfury - A fire-blooded veteran of the Warsong Clan, Dragor and his Warband have only recently arrived to Opej'nor and have already accomplished much. If the Old Wolf will bring glory or damnation to the Horde on the Doldrums remains yet to be seen. But Opej'nor is certain to play a large part in that one way or another. Eg - An eccentric Gnome builder, Eg is the reason Opej'nor has a settlement, to begin with. The genius, albeit strange individual is respected by many and known as Eg the Architect for his accomplishments.  Haytham Francis Kendrick -The current leader of the Kul Tiran force of Drustgarde Haytham has only recently earned his title and is struggling to adjust and pull his people through this troublesome time. Time will tell if he is up to the task laid in front of him by his mentor, the late Moras Beoveld. 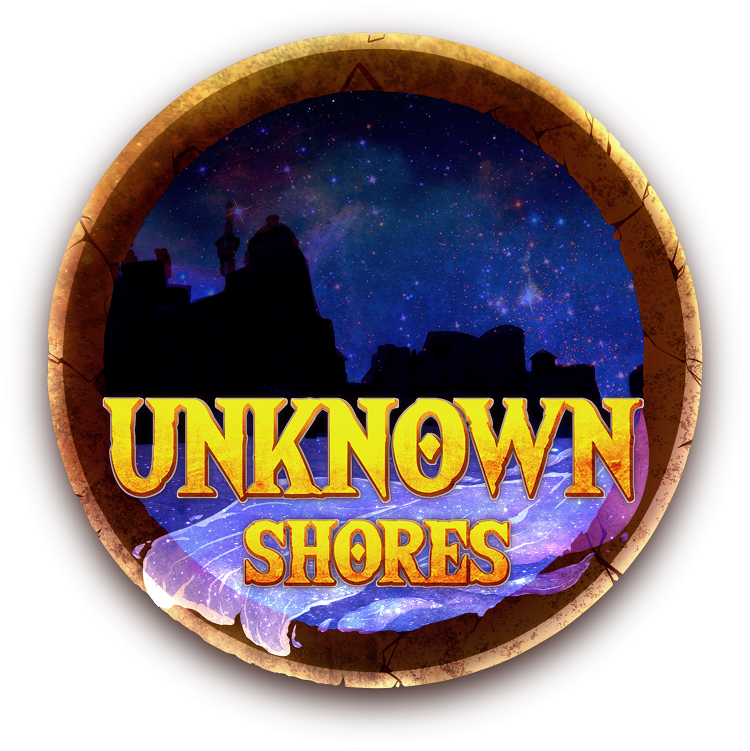 Egtown and Port Drustgarde: An odd conjoinment of shanty town and bustling port, the old shipwreck of the Dauntless has grown to prominence as one of the most bustling settlements on the Doldrums, overshadowed only by Silver-Eye island. Travelers come from far and wide to trade and enjoy all the port has to offer. Cavern of Desperation - Located near the Eastern cliffs of Opej’Nor and named very recently by adventurer’s on the island, this cave has built a reputation for the hallucinogenic mushrooms within. The corpses of new and old survivors on the island can be found within, often the last places those trapped on Opej’Nor go to find some joy before death. The Wounded Jungle - Dominating much of Opej’Nor, the verdant jungles of Opej’Nor have been cut in two by debris from Deepholm. Tearing up trees and earth, much of the greenery has been displaced or destroyed. The wounds will heal in time, but the grasp of the Shattering reached all of Azeroth. Grom'thar - Build upon the slopes of Mount Opej, Grom'thar is a budding Horde settlement. Remote and well defended, it is a haven for the true sons and daughters of the Horde who enjoy the daily challenge of battling the elements and Opej'nor's mighty beasts for survival. 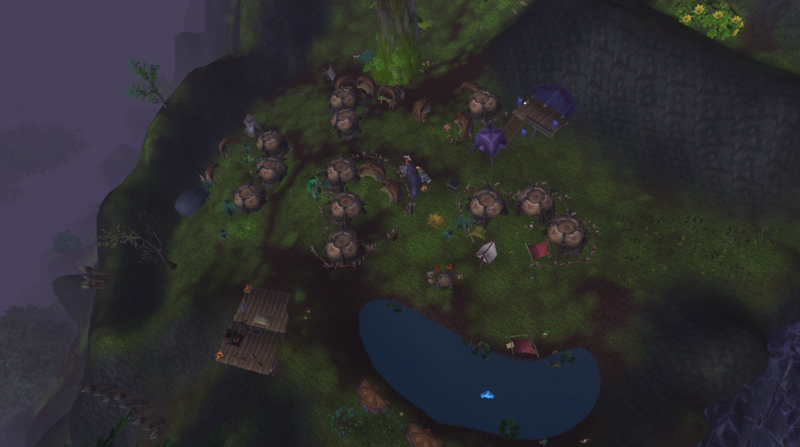 If there is any place on Opej'nor where survival of the fittest reigns supreme, it is Grom'thar. The Lonely Island - Opej’Nor’s sister island just off the Western Coast is a small sandy dot, completely dwarfed by the bigger island mass nearby. Often included in the whole of Opej’Nor, the Lonely Island still holds secrecy and sovereignty all its own. The Fractured Coast - Along the Southern cliffs of Opej’Nor, the Fractured Coast shows the strain and tear on the island, as smooth rock fractured under the weight of the massive impacts from the debris shower of the Shattering. Utterly treacherous and beautiful, it serves as a reminder of the damage caused. The Wreckage of The Thrifty - At the peak of the Southern Cliffs of Opej’Nor, a Goblin Zeppelin- ‘The Thrifty’ lays in ruins. 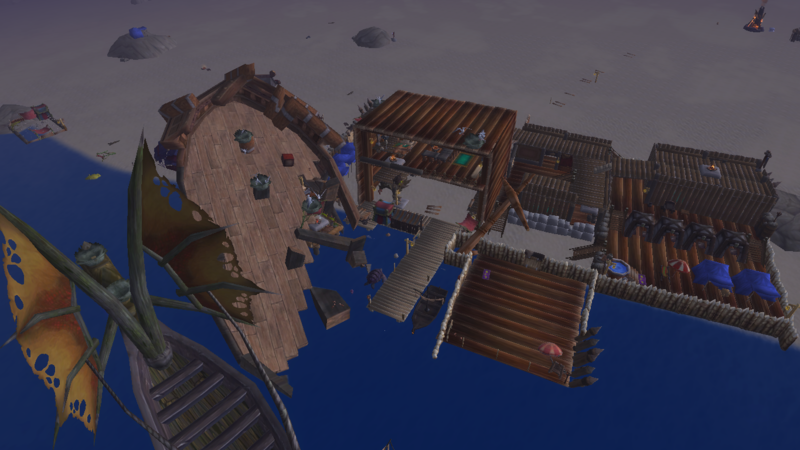 Destroyed during the Shattering, the ship came down in desperation on Opej’Nor. The whereabouts of the crew is unknown. Ogrecrush Cliffs - Located on the Southeastern edge of Opej’Nor, these cliffs are said to be where Captain Opej Ogrecrush and his crew laid down their flag and declared the island ‘Opej’Nor’. Rich in resources, beauty, and defenses- it is no wonder this place convinced the captain to call upon the might of the Horde to seek out the island. The island mass is extensive, boasting room enough for thousands of people if they were able to claim it. The harvest of resources is unparalleled, boasting massive quantities of lumber, metal, and wildlife. The North of the island is a long stretch of beach, marked with a rocky terrain and the beginnings of a thick forest, leading to a mountainous pass. The East of the island has a much wider beach, with a few crashed and abandoned shipwrecks on its shores, eventually giving way to the verdant jungle and the birth of a thick forest path into the debris-littered crater at the center.